As we have written elsewhere, this is part of a larger pattern that we detailed in August of 2014 and, arguably, extends back to 2012, including the notorious Winter Solstice of 2012. We thought that the Focused Yod in the Winter Solstice of 2012 was the most important characteristic, along with a Diamond pattern that manifested later that evening. Perfection of this occurrence of Jupiter quincunx Neptune also contains a Yod, and if you are willing to use the Nodes (lunar nodes, “Ketu” and “Rahu”) then a Focused Yod is also present here. We also have an additional analysis of this aspect located here in our Week 44 Forecast for 2016. So, in addition to facing a “big decision,” we know we are dealing with our individual and collective fates / karma (the Nodes). Chances are good that we are dealing with issues of service to others, jails, institutions, or acts of “self-undoing.” Health issues or spiritual matters may be at the forefront also. 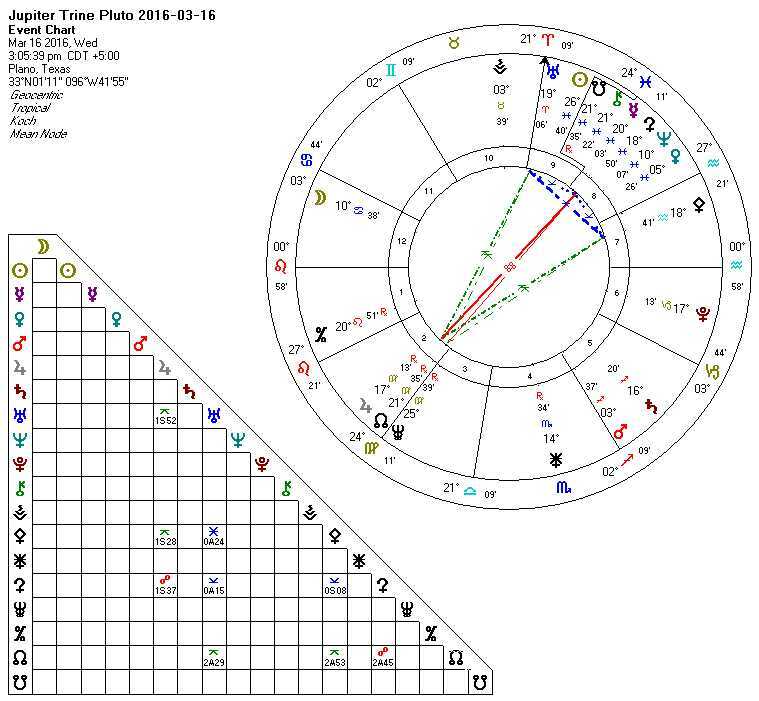 These tell us that danger, real danger, exists as tempers flare and the potential for people, places, and things to go “boom.” Note that this is following only a few days after perfection of Mars conjunct Pluto, perfecting recently on October 19th. If you can focus this energy and the related emotions, then you can accomplish much. Moon (Leo), Pluto (Capricorn), and Ceres (Aries) form this triangular pattern. Mars is two degrees away from Pluto, and Uranus is five degrees away from Ceres. Pluto and Ceres have a well known history, the story being that Pluto had Ceres (prosperity, food) below ground for about half of the year (a period of fasting and famine) and Ceres was above ground for half the year (a period of food and feasting). Halloween / Samhain marked the start of Fall, reputedly, in Celtic cultures so this set of issues seems somehow appropriate in a metaphoric sense. We think issues of prosperity / feast / famine will face some (or many) of us at this time. It may be telling us something important about this United States Presidential election and what will be coming afterwards. What may be unclear at this time will be perfectly clear by the period from next April to August (with perfection of this aspect again in May and July). The last time we had a similar series of aspects was 2004. The next time will be 2027. While they are not a “once a century” kind of rare aspect, they are not particularly frequent either. First, we encourage you to review the upcoming perfection of Jupiter Square Saturn. 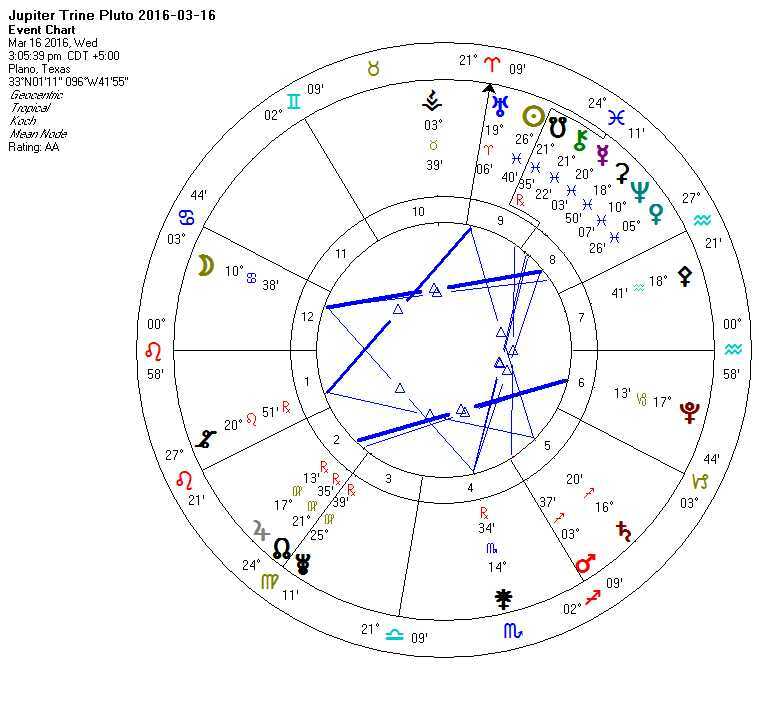 Second, we encourage you to review Jupiter Trine Pluto 2015-10-11 and review your notes from that time period. 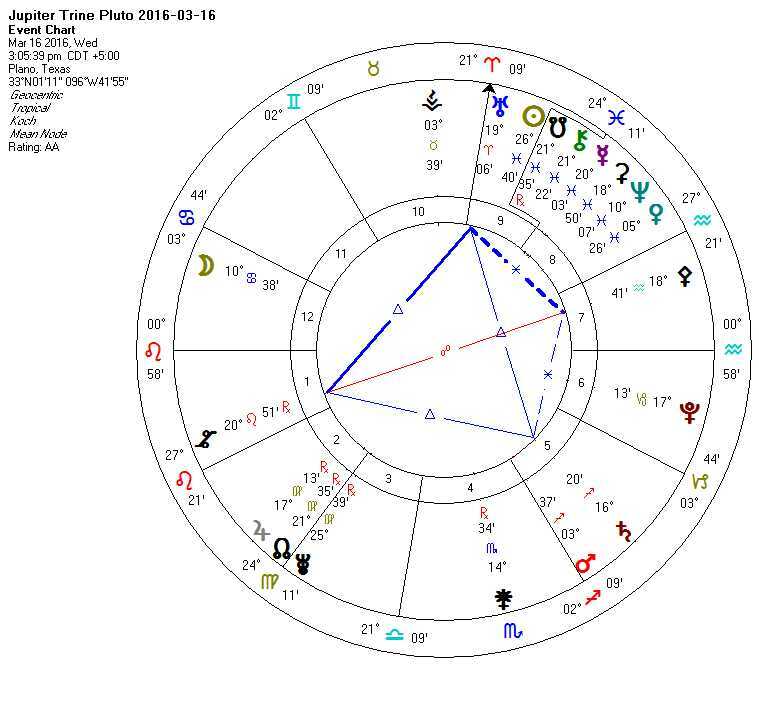 Next, we note we are discussing Jupiter trine Pluto, and we need to point out that this is a LONG TERM ASPECT. If you are in the habit of checking the newspaper or website for your “forecast today,” a fortune cookie of sorts, then you likely will NOT understand this. This REQUIRES a long-term point of view. 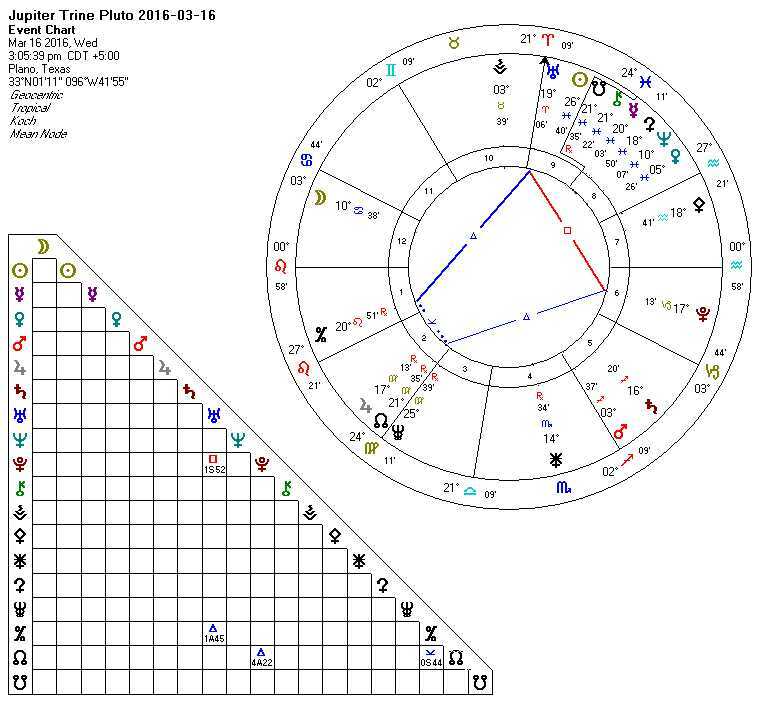 Notice that this aspect (Jupiter Trine Pluto) has been in play since January 23rd, will perfect again June 26th without losing any influence, and move out of influence July 29th. It will come into influence again shortly before the election and continue past the United States Presidential Inauguration in 2017. What does this configuration mean? For some people, it brings tremendous opportunity, particularly when any planet (notably Moon or Sun) enters Taurus during this window to for a Grand Earth Trine (this happens several times, notably a period in late April / early May). 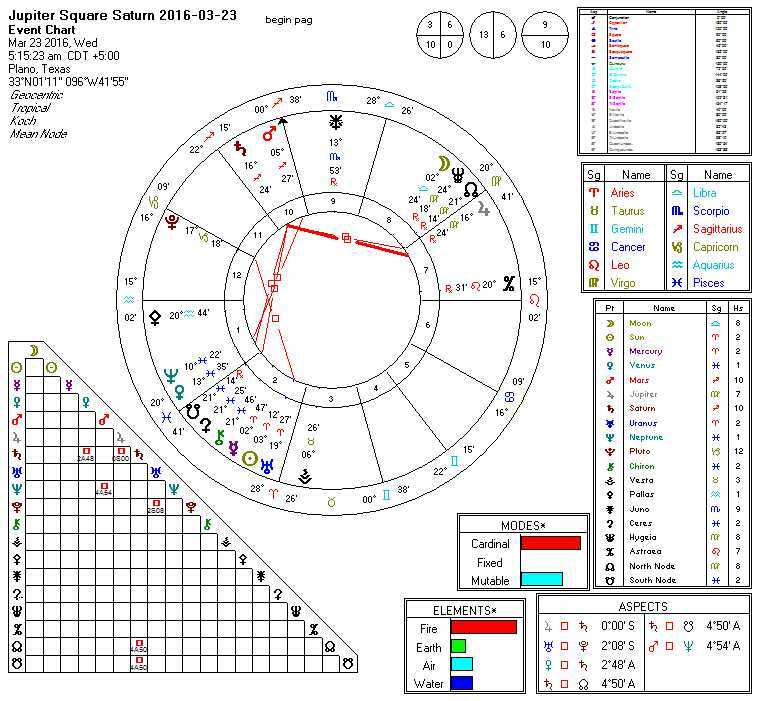 We also note that Jupiter Square Saturn may bring some shakeups, particularly in the financial markets, and we will see both “big winners” and “big losers” emerge from this. There are two grand trines! We see two possible opportunities. While we might can take advantage of both of them (maybe), is one better than the other? The Astraea / Uranus / Saturn fire trine is the better opportunity, though Saturn tells us that we will have to work (and maybe make sacrifices, give up something), Uranus tells us to expect surprises and requires changes and innovations, and Astraea tells us that this will likely involve the law and legal system. 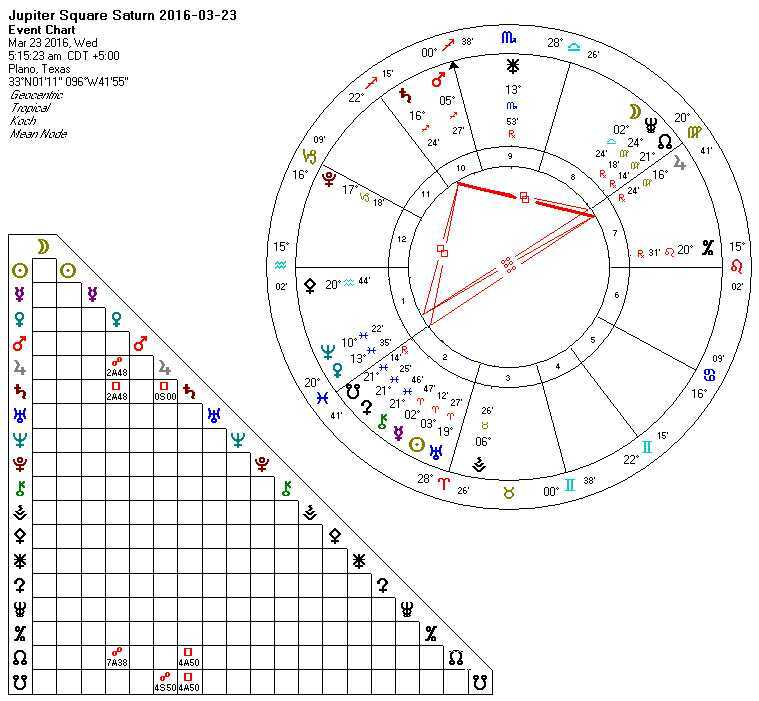 We can pick the Moon / Neptune / Juno trine, but that can involve deceit (Neptune) and being on the wrong end of betrayal (Juno). That is challenging, but keep in mind that grand water trines (such as this one) tend to bring in money. And, again, both opportunities MIGHT can be combined. Finally, overlapping Focused Yods tell us you can achieve the focus needed to “get things done” but you must make a decision, foregoing an option and choosing one to focus upon. Push through until you complete the task or project or at least make it to the most important milestone. 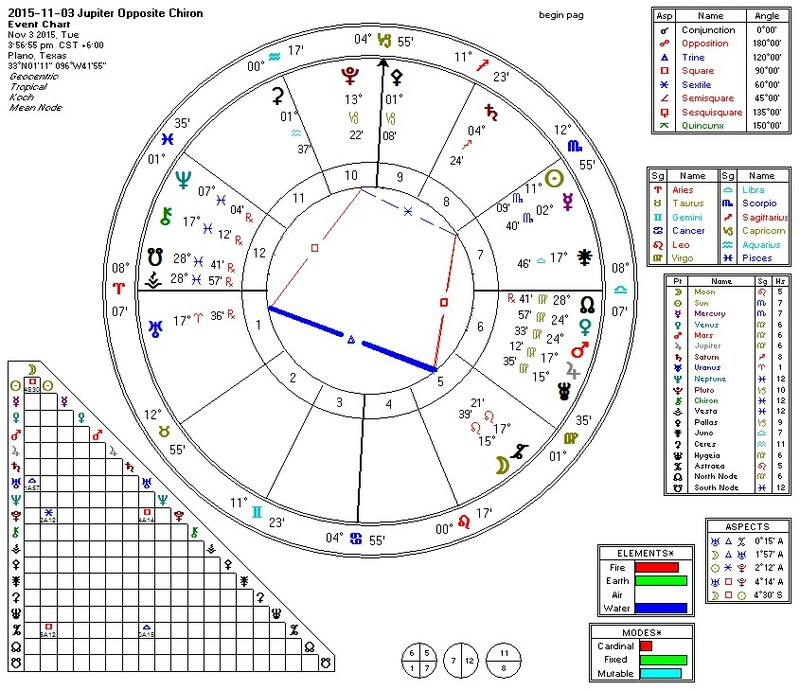 We note that the apex of the Yod is found at the South Node, associated both with old, well worn habit patterns and “taking the easy way out.” It is “doing things the way we have always done them,” and it is a bit like Vesta. However, the South Node is also about a failure to make progress. One leg of this yod ties to Juno (wives, sisters, and women in similar roles as well as issues of trust and betrayal) and the other leg of the yod ties to Astraea (law and the legal system). If you have been treacherous with someone, are you going to make amends with them, or are you going to do battle with them in the legal system? Please do note that you will have a strong tendency to do whatever it is you have done in the past, and doing something different may prove difficult despite the idea, “in theory,” that you have a choice. 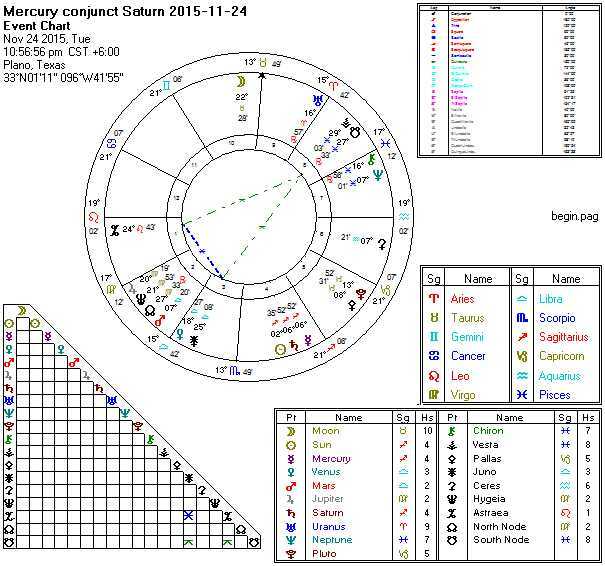 That said, the actual aspect, Mercury conjunct Saturn, is rather famous for being able to complete detailed and meticulous work. But Saturn is near perfection of a square to Neptune, and this means that Mercury square Neptune perfects within a few hours. In a natal chart, Mercury square Neptune tends to be associated with alcohol and drug abuse. It can be associated with lying and deception. But it is also a superb aspect for writing poetry, lyrics, possibly fiction, photography, and videography. If you find it difficult to sleep tonight, maybe you should review the detail work you wisely did before perfection of this aspect and look for the poetry in it. Failing that, simply write some poetry or maybe perform some creative photography. This is a good window and a good use for such things. Moving beyond the messiness of Mars quincunx Neptune earlier in the day is a worthwhile endeavor, especially if you have learned the lesson you needed to learn and can move forward. Keep in mind that the Full Moon perfects tomorrow, and if you possibly can you want to bring to a close the important steps in any project you are trying to grow at this time. So I couldn’t wait for Mars to move off his Conjunction to Jupiter on Friday and Saturday (expanded/Jupiter nervous energy/Virgo for action/Mars) as I was wanting to get to the meat of a major Transit that is just really beginning, again, to be felt in earnest: Saturn in Sagittarius Square Neptune in Pisces. 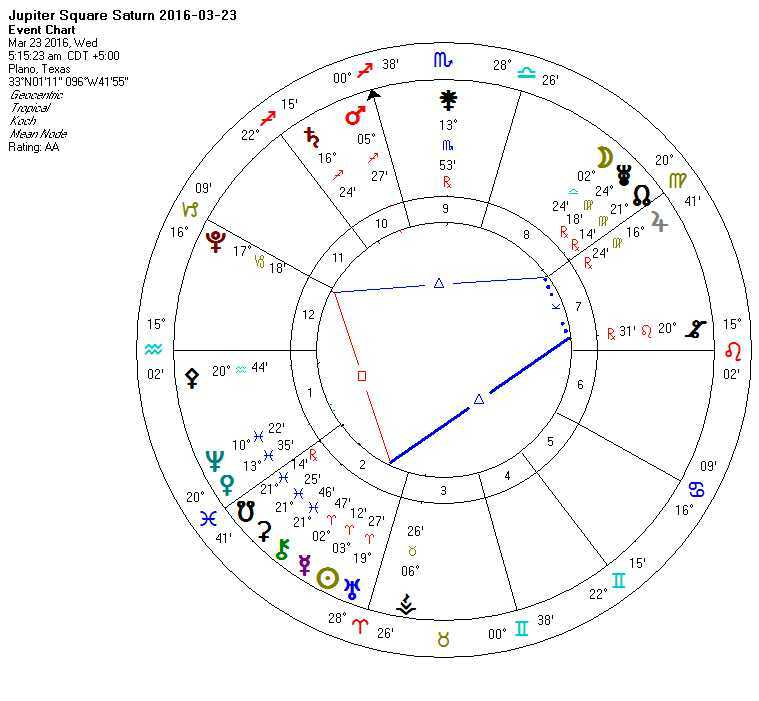 On Mar 15 of this year, Saturn Stationed Retrograde at 4:56 Sagittarius just inside a 3 degree orb to Neptune at 7:54 Pisces. Events near that time were a foreshadowing of what is come as they exact 3 Squares over the next 8year: Nov 26, 2015 and Jun 18 and Sep 10, 2016. MERCURY conjunct SATURN in (tropical) SAGITTARIUS: If well-aspected: solid self-worth, depth of the mind, forethought; inclination of philosophy, historical research and archaeology; if afflicted: tendency to melancholy, extreme timidity, low self-esteem; such people seem to ’drop everything they take into their hands’. Is what we see real? Is it a illusion? Is there a barrier between realms? If it is all an illusion then why do our actions have consequences? A day of metaphysical pondering awaits! 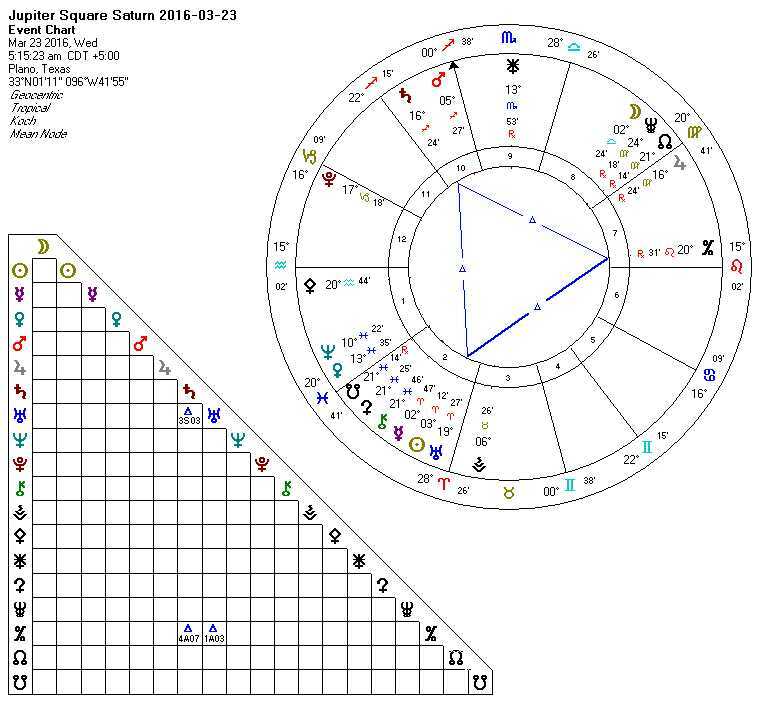 Dream versus reality, fantasy versus fact, ocean versus earth: Saturn in Sagittarius square Neptune in Pisces is closing in – the first square will occur 26.11.2015 at 7°. The world feels like a harsh place these days. Terror in France and Libanon, war at so many places on earth, with religion as a driving force, so much faith without love, so many people fleeing their homes, so much fear and no answers. 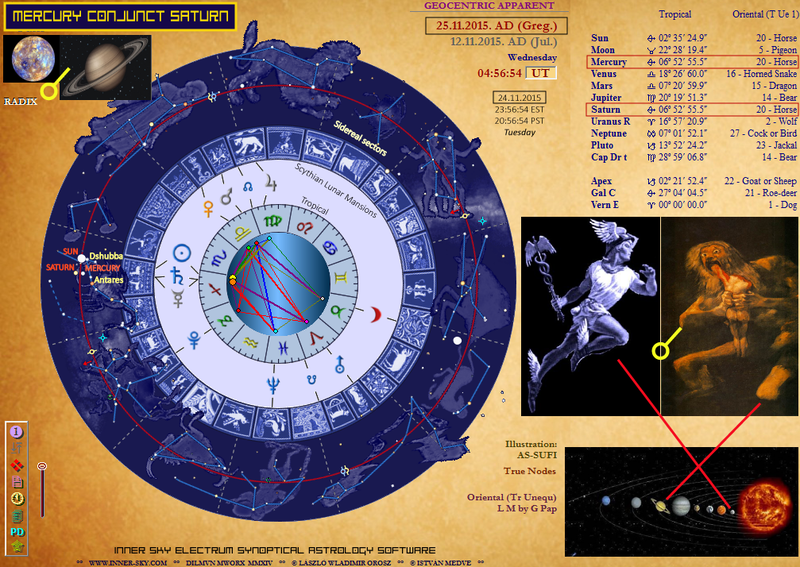 When Saturn and Neptune meet next week, they will touch my natal Neptune in Sagittarius, exact at 7°. The last weeks I fought my personal fear and disillusion. I felt alone and disconnected. Maybe this is the shadow of this aspect, but there is light somewhere. 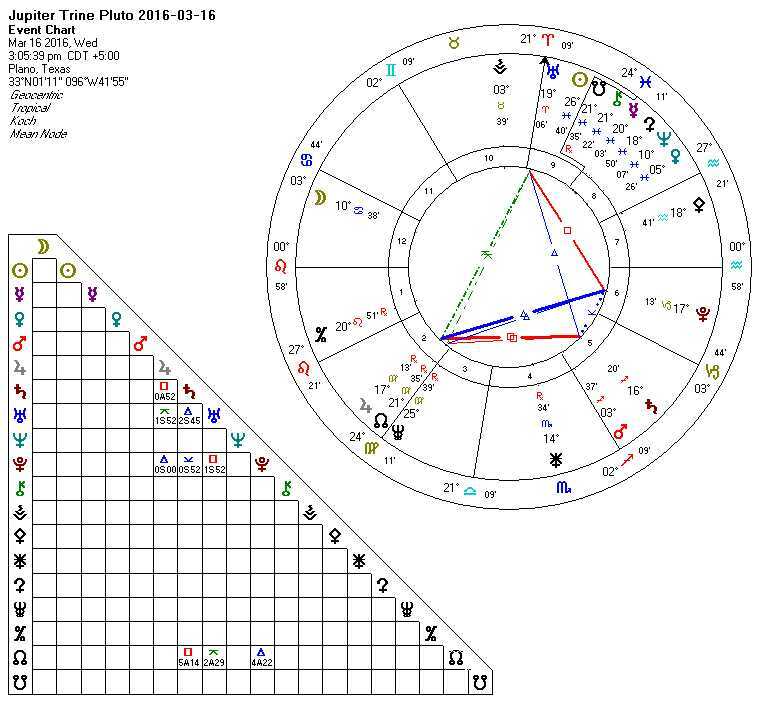 Saturn will sextile my natal Jupiter in Aquarius and my natal Pluto at 6° Libra, so he will act supportive in a natal trine that gives me lots of transformational energy. NEPTUNE in PISCES, presently retrograde and ‘stationary’ (apparently very very slowly moving backwards in the Zodiac, from Earth perspective) goes direct on Nov 18, AND will be also squared by SATURN in SAG on Nov 26 (the effect of this transit is noticeable all Nov and Dec). SATURN and NEPTUNE have a 35-year cycle together (from conjunction to square to opposition to conjunction). 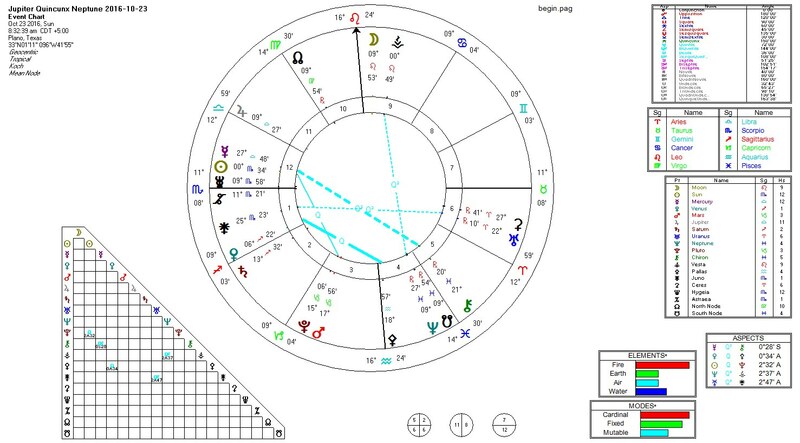 The present SATURN – NEPTUNE cycle started with their conjunction in 1989 when the Berlin Wall came down, setting off an avalanche of crumbling of the Communist regimes in Eastern Europe. NEPTUNE in its own domain of PISCES (from 2012 until 2026) is in Nov and Dec one of the focal points in the Astro~Weather, since it’s changing direction from Earth perspective. It’s a good idea to be aware of its Archetype, and able to recognize what’s up when we’re getting ‘hooked’. You have been feeling it at least for the last week or two, and you may have been feeling it since before the final Blood Moon Eclipse of the 2014/2015 Tetrad. 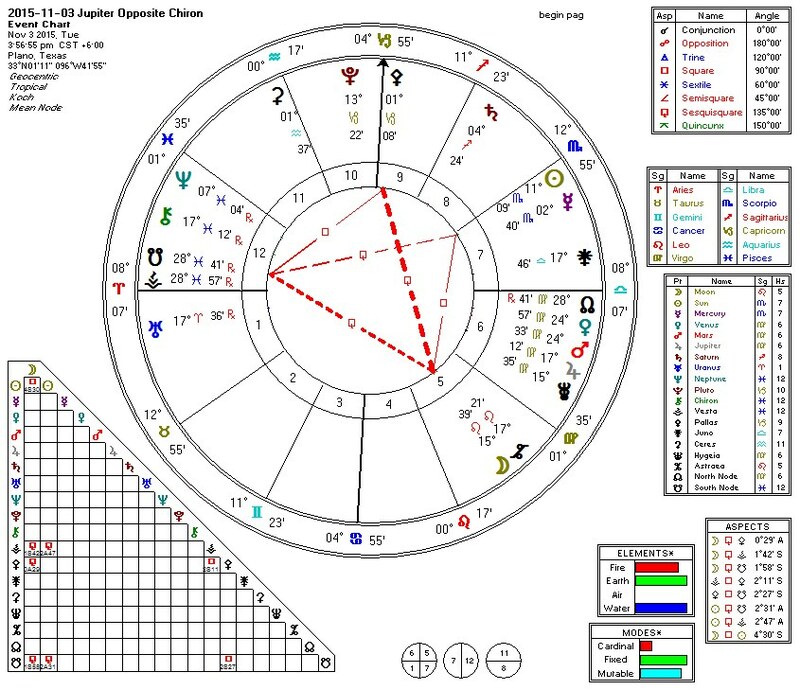 It is Jupiter Opposite Chiron, and it is part of the mix associated with Jupiter Opposite Neptune and other aspects we talked about perfecting on September 17th of this year. It brings to a head key issues involving health and healthcare, or teaching and education, or mentoring and 1:1 collegial relationships; or some kind of mix of two or all three of those. Today the aspect perfects. You may have already received the relevant (and critical news) last week or the week before. You may receive it in a few days. Often “nothing happens” on the day of the perfection of these critical outer planet turning points. But Jupiter has a twelve year orbit, and Chiron has a fifty year orbit, so your precise personal variant of how this affects you may not be “day of the perfection.” The “orbs” (boundary lines for events) of the Moon are hours long and based on a 28 day cycle. Since the same sized orbs (measured in degrees of a circle) are based on Chiron’s fifty year orbit, expect those “orbs” to last 365 x 2 (730) times as long. If we allow 2 hours on each side of the Moon’s orbs, then we should allow about 1,460 hours for Chiron, which translates to about sixty days (about two lunar months). Jupiter’s orbit is only twelve years, so the corresponding orbs should be about twelve days (half a lunar month). THIS issue of “orbs” is why we keep referencing that pivotal date of September 17th (and also October 11th) as a turning point for the outer planet (“generational planet”) events through the end of the year. Chances are VERY good that you will NOT feel this perfection “day of” the event (unless it EXACTLY aspects some planet or point in your personal natal chart), but you WILL feel it in the two weeks prior or two weeks after (Jupiter’s orb, using the fastest moving planet and, therefore, the smallest and most precise window). And, as an aside, if you look back to the days “near” September 17th (allowing some latitude due to Jupiter’s orbs), you will note an important turning point there. And, by “latitude” we mean this turning point could have been earlier, maybe on the 11th or 12, or later, maybe on the 21st or 22nd. But, you had a turning point, and you made a decision. You made some important decision at that turning point. It may not have seemed important at the time, but, in hindsight, you will eventually see that it was the kind that changes the course of your life. You do have some choice in the matter. The planets in the sky are invariant, but your personal, individual decisions are not. Or maybe you are an older adult who did, or did not, see a physician. Depending on your situation, you can see where things may be going with your health and healthcare. And if September 17th was not the turning point, then surely the days surrounding the Focused Yod associated with the perfection of Jupiter Trine Pluto on October 11th were. Focused Yods are all about not only making decisions but taking the necessary action to accomplish the results. So, what is “it” that you will feel as this aspect perfects? We re-iterate: some key point involving education, healthcare, or mentoring. Since Jupiter ALSO rules the legal system, this could involve the law and possible lawsuits. But, the key issues will be education and healthcare (Chiron). We see all of this tied into the current political debates. And, as an aside, Jupiter ALSO rules foreign relations (particularly ambassadors) and, therefore, issues of immigration. Think about it: these are the key issues of our current political climate. (Health (“Obamacare”), Education, Foreign Relations (Middle East, China, et al), and Immigration (particularly Mexico and points south). We also see a Thor’s Hammer present. Actually, we see TWO of them in a configuration that we have previously named a “Thor’s Hammer Key.” The presence of TWO patterns almost always means, in astrology, two or MORE situations involving that pattern (here the Thor’s Hammer associated with impulsive actions, extreme conflict, and people like Adam Lanza). As many of you can “guess” from the situation in the Middle East (specifically Syria but other problems also) and Eastern Europe (the ongoing Russia / Ukraine conflict), we live in dangerous time. As an aside, as we have said before, people who have violence and physical altercations woven into their life (soldier, police, boxers, MMA athletes, bar room bouncers) may actually BENEFIT from this kind of pattern. But, if you are not one of those kind of people, best to avoid them (or people or situations that invoke their presence) if you can. We do not see particularly significant patterns in 5th harmonic or 7th harmonic aspects in this chart. So, no brainstorms or karma issues to work through. This is all about temporary allegiances and doing the work to get the job done (without being angry or impulsive).